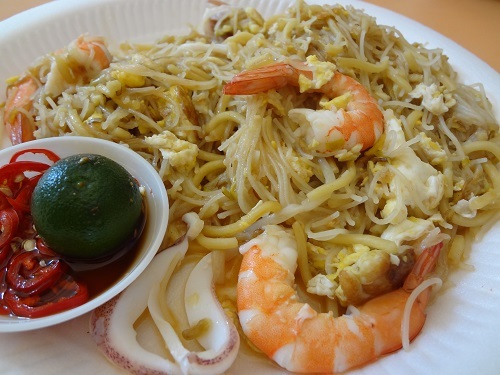 Hokkien mee is really one of those dishes we have a love-hate relationship with. What makes it so yummy – the lard, in case you don’t already know – is also what makes us feel so guilty afterward. We always try to indulge in moderation when it comes to dishes like this! Abstinence is just too hard in the face of such deliciousness. There are many Singaporean dishes that are hotly contested over – the ‘best’ one is never obvious. However, that’s not true for all foods – in fact, we think that for the best Hokkien Mee in Singapore, there’s just no competition. Nam Sing wins hands down. Supporting our statement is the amount of time we had to wait for our food. With the line ahead of us, it took us 40 minutes before the steaming plate of noodles reached our table. Lesson one: for good food, make sure you nibble on something else first to stave off the hunger pangs! 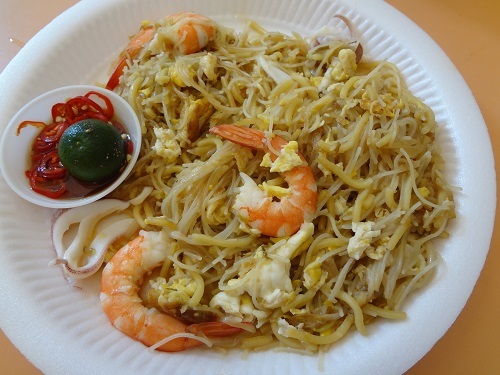 At first glance, it looks just like any other Hokkien Mee: with its standard mix of yellow noodles, mee hoon, bean sprouts, lots of eggs, prawn, sotong and stock. But what makes Nam Sing’s so magical is how they have perfectly balanced the level of moisture in the dish. 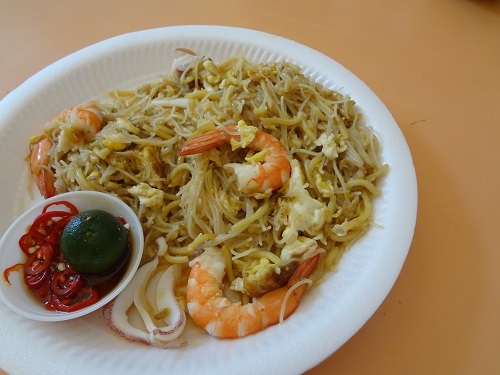 The mee here doesn’t taste like your ordinary hokkien mee: most versions of Hokkien Mee are soggy and wet, often becoming a little slimy and bland after the first few bites, but Nam Sing was not soggy at all, yet it wasn’t too dry either. Nam Sing’s version cleverly retains sufficient moistness to keep the flavour intact, with the fragrance of seafood permeating every strand of the noodle. Though deceptively simple-looking, the rich flavour of this dish, coupled with the freshness of the ingredients will truly bowl you over. Each mouthful delivers a delicious hit so satisfying that you can’t help but keep going till it’s all gone. We’ve really got to hand it to the chef here – he has obviously mastered this local dish, raising it to the level of a masterpiece. 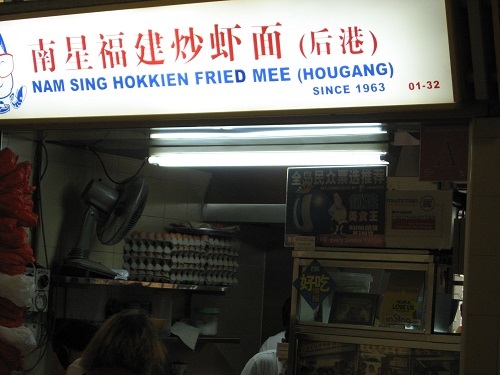 We daresay this stall deserves to be crowned the king of Hokkien mee. A five stars in this category.